Vinati specialises in the production of lifting equipment and material handling solutions for the power industry. Established in 1958 in Brescia, Lombardy, Italy, Vinati employs 40 people, with average sales of €7m a year. Vinati prides itself on long-lasting partnerships with customers, which provide time to produce specific solutions and quality products. Vinati also uses advanced technical design softwares. Runways and metal structures are also available. Vinati products are used in a range of industries, including forging and waste management centres, chemical plants, automotive manufacturing, carpentries, power plants, aluminium plants and oil extraction platforms. Vinati provides a technology-advanced maintenance service, which includes an online technical database. Our technicians can access this to provide customers with support and information. Customers also have direct access to this, in order to monitor their own cranes and stored information about maintenance service, repairs and replacements. Vinati’s maintenance service is in operation all year, 24/7, and looks after more than 1,000 cranes a year. Our patented and innovative anti-sway and black box system technology for cranes, called Acubo™, was engineered by Vinati specialists. It uses a triaxial accelerometer computer and a gyroscope, which can detect movement of the crane and rope. Acubo™ can also automatically set the optimal dynamic displacement of the crane. Data logs are recorded and made available to customers for safety and management purposes. This data is integrated with technical details on the online maintenance system (CIMS™) to improve efficiency and safety of our products. Acubo™ can also be installed on an existing crane system or included in a new one. Laser systems are used on our cranes to help operators position the loads. This increases safety and reduces operational time. 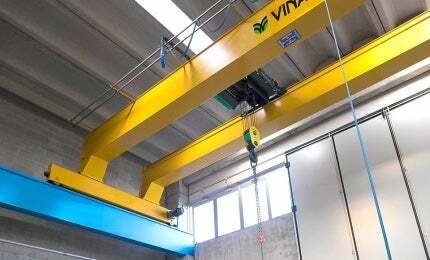 Among the winning characteristics of Vinati, which specialises in the production of cranes and lifting systems, is a propensity for research and development, an area in which the company invests 30% of its turnover, with 13 employees dedicated exclusively to this industry.